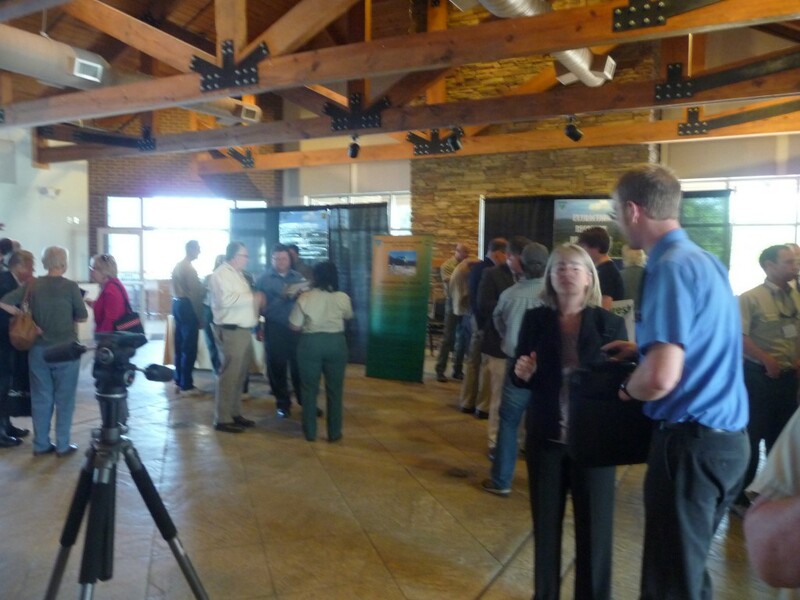 On Thursday evening, April 25, the Bureau of Land Management (BLM) and the US Forest Service (USFS) held their long awaited “public informational meeting” about mineral leasing on National Forests in Alabama. The agencies have been promising to hold this meeting since July 8, 2012, after withdrawing 43,000 acres of proposed lease sales, mostly on the Talladega National Forest, from BLM’s quarterly auction of leases last June. The withdrawal came as the result of a letter of protest and a notification of intent to sue both agencies by the Southern Environmental Law Center on behalf of Wild South and the Natural Resources Defense Council, as well as loud and widespread public opposition to the proposed sales. Only 52 members of the public attended the 3-hour “open house” format meeting, and that included 15 individuals representing Wild South and its Kill the Drill partners, notably the Alabama Rivers Alliance, the Black Warrior Riverkeeper, Cahaba Riverkeeper, Coosa Riverkeeper, and the Shoals Environmental Alliance. 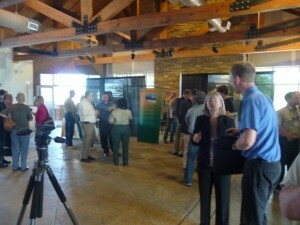 BLM and USFS personnel present outnumbered the public pretty much throughout the event. From 35-40 federal employees were present, in addition to two persons from the Alabama Oil and Gas Board. Suffice it to say the agencies had the venue well in hand, controlling the flow of visitors and the entire informational process. No provision whatsoever was made by the agencies to accept public opinion or comment on federal leasing policies and procedures. Steve Lohr, Forest Supervisor for National Forests in Alabama, made it clear prior to the meeting that, “This meeting is designed to be informational and there are no current proposals open for public comment or protest…..This is not a meeting to argue the pros and cons of the policy; rather, a meeting to show the public where and how they can interact with this process.” The flow of information at the open house was definitely a one-way flow. Five instructional kiosks, with copious visual aids, depicted all aspects of the leasing process, regulation of oil and gas operations on national forest lands, maps identifying current and possible future proposed leases, and the nature of leasable mineral resources in these areas. Significantly, there has been interest expressed by the gas industry in leasing parcels across the entire southern half of the Bankhead National Forest. Agency officials let us know that we could see Bankhead parcels proposed for mineral leasing by the December, 2013 BLM sale, the notice for which will be posted in September. Concerning the current status of mineral leases on Alabama’s national forests, there are no active leases on the Bankhead, Talladega, Shoal Creek or Tuskegee Districts. In the Oakmulgee District of the Talladega NF, there are currently approximately 5,432 acres under lease with no active wells. 85% of the Conecuh NF is currently under lease, with 3 active conventional oil wells. Of particular note, it was learned that, contrary to what we had previously been led to believe, the proposal to sell mineral leases on 43,000 acres of the Talladega NF last year was NOT the result of an expression of interest by anyone in the oil and gas industry, i.e. an interested bidder. These parcels were nominated by “Bureau Motion,” a nomination made by either BLM or the Surface Management Agency (in this case, the Forest Service) following an annual update report from the USFS to BLM on their consent to lease specific lands. The USFS could have made the nomination anytime in the year previous to the June 2012 sale, as BLM typically can take a year to include a nominated parcel in one of their quarterly competitive sales. We are still trying to get to the bottom of why this particular bit of information was not previously shared with a very concerned public. Toward the end of the evening, Wild South staff presented Forest Supervisor Lohr with the signatures on the Kill The Drill petition to date and emphasized that these signatures represented a fraction of those opposed to the sale of oil and gas leases on our national forests in Alabama who could not make it all the way to Montgomery on a weeknight. Moving forward from here, we must continue to spread the word and educate the public about this threat. Click here for Talking Points. Involvement by our state and federal legislative reps remains our greatest point of power for permanent change. Our legislators need to be educated about this issue and they need to hear from all of us, especially those representatives whose districts are adjacent to and within national forest land boundaries. Anyone who needs support with that is welcome to contact us and to use our online legislative packet. Our Kill The Drill online petition remains active and we continue to encourage people to sign it. We also provide paper copies for out-in-the-communities use. On June 8th the Bureau of Land Management (BLM) and the US Forest Service announced the delay of the lease sale for 43,000 acres of your public lands to the oil and gas industry. Thousands of you spoke up and your voices were heard. But the public outcry must not stop here. We can not allow the BLM and Forest Service to just use stall tactics with the hopes that we will just go away. In fact, Wild South learned the day before the announcement was released that the Forest Service is now looking to allow leases to be sold in our beloved Bankhead National Forest. We must put an end to this madness. To keep drilling out of our national forests permanently, we must continue to grow the movement that got the attention of the BLM and the resulting delay. A delay is not good enough. We demand that our public lands be permanently freed of the destructive threat of oil and gas exploration and potential fracking which is one of the greatest environmental threats of our time. It is imperative that our state representatives hear from us and that the United States Forest Service hears from them. If at all possible, schedule a personal visit with your state senator and representative in your district, especially those whose districts include national forest lands. Organize a group visit. Discuss your concerns about oil and gas drilling on our public lands and ask them to write a letter to the Forest Service opposing the sale of leases to the oil and gas industry. If you don’t know your state legislators, go here and enter your zipcode in “Find Your Legislator” in the left sidebar. The legislator packet contains excellent talking points in The Case Against Drilling on our National Forests. It also contains a list of the loopholes and exemptions in federal environmental laws for fracking and other oil and gas operations, as well as a list of the addresses of all the USFS officials and our Alabama senators to whom we want our state legislators to send letters. For inspiration, read this recent editorial in The Anniston Star, Embarrassing Silence, and also the guest column in the Cullman Times written by Wild South member and former board member Billy Grayfox Shaw, which can also be found in the legislator packet. If you missed the Great Fracking Debate on Sunday evening, July 1, it is available for viewing here. Attend Wild South’s public meetings about our campaign to stop drilling on our National Forests in Alabama. Posted in Campaigns, Events, Latest News, Press Releases, Take Action! I was born and raised in Al, and now live in WV. I do not want to see Al go into the direction that PA and WV have gone with the fracking. Please keep fracking out of the Al National Forest. I would be willing to buy a t-shirt with the above logo or something about Keep the Frack out of Alabama. Is this something we have time to do? Both to raise $$ and as a public awareness thing? I just watched “Fracking Hell” on Link tv this week. Fracking needs to be banned and we certainly don’t want it in Alabama. Fracking is already here in Alabama, and has been for quite a while, related to coal bed methane production. CBM wells are conventional vertical wells, but the frack fluids used still contain some very toxic chemicals, such as napthalene and glycol ethers. EPA estimates that a very significant proportion of produced water in the CBM wells of the Black Warrior Basin are discharged directly into surface waters. Fracking in shale beds in Alabama, however, has been very limited so far. We must unite and stand against this terrible plague known as hydraulic fracturing. If you are unfamiliar with this method of natural gas extraction, then watch “gasland” by josh fox. I was born and raised in alabama, and I am a dedicated democrat; I have been following the largest sale of public land to private hands in the west during 2005, and have watched this scourge slowly spread east. These lawmakers are scumbags-making it nearly impossible for a full time student who also works full time to attend this open house and I am outraged! Stop this tracking now! Please, Alabama residents that drink water, fish, or participate in water sports, sign this protest against hydraulic fracking in our national forests.